Perhaps that's why the brightness of Spielberg's future D.C. is so garish and uninviting. Using the bleach-bypass method he employed for Saving Private Ryan, Spielberg casts his world in a quasi-chiaroscuro, not fully employing black-and-white but suggesting the obliteration of a moral gray area in this new societal order. Anyone predicted to kill by the "PreCogs" is guilty and arrested before the act is committed. There are no extenuating circumstances, no appeals, only a quick journey to a massive prison that resembles a high-tech Guantanamo. Some of the police offers working in PreCrime have never even covered a homicide. They simply trust in the system, which clearly marks people as either innocent or guilty. But naturally, there isn't much drama in a world where evil has already been figured out and dealt with, and soon Anderton's faith in the new way of things is directly challenged. First comes the intrusion of the bureaucracy, in this case Danny Witwer (Colin Farrell), a representative of the attorney general. Before PreCrime can go national, the federal government wants to make sure there are no flaws. The fact that Witwer is even investigating the system cracks the illusion of the system's infallibility, and his intervention sets in motion events that lead Anderton to a potential flaw, at which point his world turns upside down. Predicted to kill a man he's never even heard of, Anderton must flee and try to clear his name, and Spielberg stages a number of impressive chases as the chief ducks his co-workers. He leaps across maglev cars racing at hundreds of miles per hour in every direction, hitches unwitting jetpack rides off the officers come to arrest him and dukes with Witwer in a car manufacturing factory before driving away in the car that is constructed robotically around him. Spielberg's direction is at his most fluid and dynamic, the welcome return of his more coherent, formal style communicating as much energy as Saving Private Ryan with out all that camera jostling tedium. A sequence in which tiny, retina-scanning automatons move through an apartment looking for Anderton is filmed, De Palma-style, with a top-down camera gliding over the partitions of rooms, peeking in on the domestic bliss and drama of the tenants as the mechanized creatures scurry around looking for their mark. As a showcase for Spielberg's talent with action filmmaking and pacing, Minority Report is his best pure rush since Indiana Jones and the Last Crusade. Yet it also displays some of the director's deepest conceptual probings. Like so many of Spielberg's films, Minority Report details a loss of innocence, only here this loss is visited on an adult instead of a child, and more than once. Anderton's world is shattered once when his son disappears, but he also loses the new, cocooned world he creates around himself when his name comes up as a future killer and he is put on a path to undermine the PreCrime program. Spielberg finds complexities in the man by staging him as both perpetrator and victim, someone who deliberately sets out to uncover the truth and is then wracked by those revelations. The titular minority report refers to an aberration among the hive-mind visions of the three PreCogs, a "disagreement" on how a future might play out. Anderton goes so far as to abduct the most powerful of the PreCogs, Agatha (Samantha Morton), to try to find his own minority report, to be told that he really doesn't have to kill the unknown man he's been predicted to murder. However, if he did have a minority report, he himself would disprove the fallibility of PreCrime and the necessity to dismantle it. And yet, as the "inventor" of PreCrime (Lois Smith) tells him, the best way he could destroy the system would be to kill the man, thus proving its inability to fully protect people. No matter what Anderton does, everything will change, and he'll be destroyed by it. Naturally, Spielberg uses this foundation to toy with the notion of fate. Agatha, once sprung from her holding chamber to accompany Anderton, can predict even small occurrences that happen without fail. Yet it is also she who tries to urge Anderton not to carry out his predicted destiny, arguing that his knowledge of his future gives him the power to change it. But it is precisely that knowledge that ultimately leads him to the doorstep of a man he does not know, at which point he discovers something that makes him capable of the murder Agatha and her siblings foresaw. This constant mixing of paradoxes, ironies and quandaries is visualized in the film's key shot, perhaps the single most striking shot of Spielberg's oeuvre, that magnificent two shot of Anderton and Agatha holding each other, their heads seemingly growing out of each other's. As Agatha shares a hive mind with her siblings, so does she swap thoughts with Anderton for a moment: having stolen Agatha to try to clear his name, Anderton now feels that he must go through with the predicted action, while Agatha the psychic tries to convince him to change his fate. This is heady stuff, exceeded only by A.I. 's uncompromising views on humanity itself. 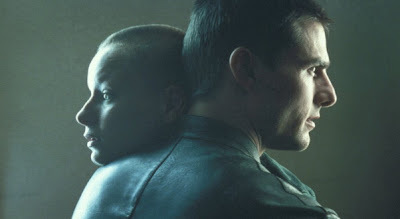 But apart from the director's more current interest in moral complexity, Minority Report also features a unique take on the classic Spielberg theme of neglectful parents. Here, he flips the dynamic, so that instead of focusing on the wronged child, we see the parent coping with his failure, whether perceived or real. Anderton blames himself for Sean's kidnapping, and he can hardly live with himself for it. Loyal to the legal system and outwardly so strong, Anderton retreats into a drug haze when in private, watching old home movies as he dopes himself to blot out the pain for a few minutes. The aforementioned retired PreCrime pioneer likewise comes across as the regretful parent, viewing herself as having failed children who were born different and then experimented upon without care. 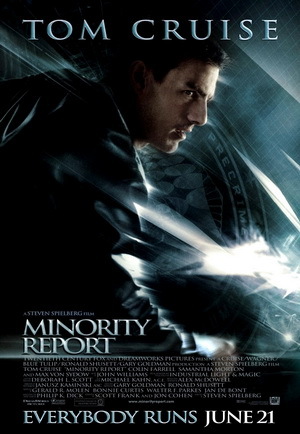 Though not as direct an examination of Spielberg's dearest preoccupation as Catch Me if You Can, Minority Report nevertheless represents one of the director's last great looks into one of his foundational hangups, this time from a different angle that exposes new moods and interpretations. Like Spielberg's other 2002 film, Minority Report represents a meeting of the director's two best sides, the populist audience-charmer and the serious-minded artiste. Some criticize the ending, and I agree there are a few issues. Any time you see Max von Sydow in a film, you can pretty much bet he's guilty of whatever the crime is, which dampens the suspense somewhat. As to the charge that its "solution" to the PreCrime system is too absolute, I never could gel with that reading. I've always believed that it's better to let a guilty man go free than to cage an innocent one, and by revealing the flaws in the system, Anderton and others have no choice but to scrap its progress. True, Spielberg doesn't even try to address the larger framework of justice, but that's a subject for another film. Perhaps, continuing off his Kubrick high, the director incorporated the lesson that the late, great director imparted with his altered finale of A Clockwork Orange, that dismantling a bad cure for horrible actions is as important as finding a working method of treatment for crime. Minority Report doesn't set out to find a bold new solution to law and order but to discard a flawed one. And in the face of subsequent foreign and domestic policy in this country, the film's message has since come to resemble a warning. Marvelous review, Jake. This is always going to be one of those Hollywood movies that somehow had the good fortune to be released exactly at the right time. And I have a feeling it will age nicely, too, because decades after the Bush Era we will probably still be facing these same troubling issues of privacy control and premeditated crime-stopping. One thing I wondered about the movie for a number of years is why the inmates of PreCrime have to be frozen in time with those halos on, rather than be afforded the liberty to roam around in the spaces of prisons. They technically haven't, after all, done anything, so I couldn't understand why their punishments are even worse than those of the real-life prisoners in our own time. Then I read Joseph McBride's thoughts about the movie in his new book on Spielberg, and it hit me: this is what we've been doing to the prisoners at Guantanamo. They, like the inmates of PreCrime, are not getting trials, are not allowed to have attorneys, are being blinded to the realities around them (in their case, with black masks instead of halos) and are being menaced by our military's German shepherds (i.e. PreCrime's magnetic spiders). So the dark visions of this movie are, sadly, not too far off from the real world, intentional or not. Although the ending is imperfectly rendered, it's never bothered me. In retrospect, it is, yes, easy to figure out that Burgess is the bad guy, but Von Sydow delivers that suicide scene so beautifully ("Forgive me, John... forgive me, my boy") that I can't complain. Burgess is sort of like a stand-in for Bush: a well-meaning old man who doesn't realize how much he's screwed up the whole system with his ruthless measures. As you've written, I think it's okay for Spielberg to end the film on a positive note, too, because one can sense that he truly, honestly wants to see Anderton prevail at the end. To be sure, the very dismantling of the U.S. justice system itself makes it a bittersweet ending, so the movie resonates alternately as a solid entertainment and as a message of caution. Nice piece, Jake. I love this film too, I'd rank it among Spielberg's best. As you say, it's a fantastic action flick, but it also has some pretty interesting ideas about justice and morality at its core. I like your connection of it to the Bush era abuses that followed in its wake, there are definitely some eerie parallels there. The ending's a bit too tidy, so much so that some people have tagged it a hallucination of a still-imprisoned Anderton, an interesting reading that I don't quite subscribe to myself. But unlike some other Spielberg films that are compromised by his usual problems with endings, I don't think the ending does much, if anything, to detract from this film; the implications of the film's bleak view of justice and fallibility remain even after this happy ending wraps everything up. Thanks, both of you. But I don't know that I can agree with either of you that the ending is particularly positive. I mean, it's no Brazil, that's for sure, but I don't see it so much as a victory for Anderton but, as Adam says, a bittersweet conclusion. John may be free, but his whole system of values is now pretty much destroyed, and he doesn't really know where to go from there. I can agree that the ending is too tidy, but as Ed says, it doesn't detract from what came before.